Looking for an oven-baked chicken recipe with a hint of heat? 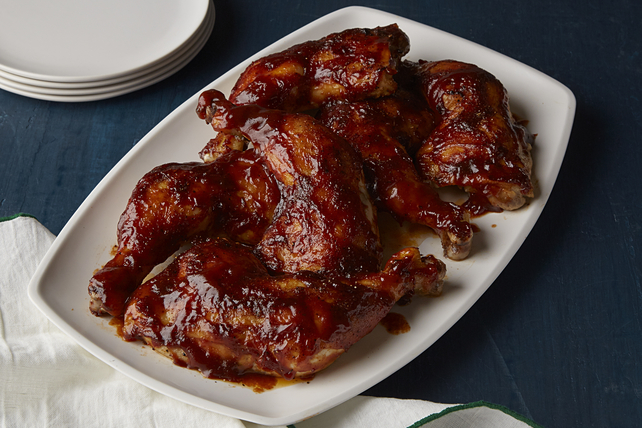 Our BBQ-Adobo Chicken Legs recipe fits the bill. Quick, tender and full of flavour - everything you want in a weeknight chicken recipe! Combine dry seasonings; sprinkle evenly onto both sides of chicken quarters. Place on foil-covered rimmed baking sheet sprayed with cooking spray. Bake 30 min. Meanwhile, mix remaining ingredients until blended. Brush half the barbecue sauce mixture onto chicken; bake 10 to 15 min. or until done (165ºF), turning and brushing with remaining barbecue sauce mixture after 8 min. Heat greased barbecue for indirect grilling: Light one side of barbecue, leaving other side unlit. Close lid; heat barbecue to 350ºF. Season chicken as directed; place on grate over lit area. Grill 3 min. on each side or until grill marked on both sides. Transfer chicken to grate over unlit area. Grill 15 min., turning chicken after 8 min. and monitoring barbecue for consistent temperature. Brush chicken with half the barbecue sauce mixture. Grill additional 10 min. or until chicken is done (165ºF), turning and brushing with remaining barbecue sauce mixture after 5 min.